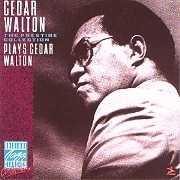 Cedar Walton, piano; Leroy Vinnegar, bass; Billy Higgins, drums. In the late 60s, after stints with J.J. Johnson, The Jazztet, and Art Blakey's Jazz Messengers, Cedar Walton had decided to free-lance in New York and quickly became everyone's favorite pianist. He was an important part of record dates for a wide variety of horn stars of the period. Walton and Prestige producer Don Schlitten conceived his Prestige sessions to highlight his playing, his compositions, and his unique small-band arranging abilities. The selections here are taken from his first three Prestige dates and all songs are Walton originals. His sidemen are players with whom Walton had a close working relationship at the time. Kenny Dorham had used Walton as his pianist on many of his Riverside dates in the late 50s. Walton had filled in on piano for Horace Silver when Blue Mitchell and Junior Cook recorded for Riverside using the rest of the Silver quintet as sidemen. Clifford Jordan was another Riverside artist who called on the services of Walton. And Billy Higgins would be one of Walton's most frequent collaborators and a founding member of Eastern Rebellion. Since these recordings, Walton has gone on to international celebrity. There have been many more recordings, but the solid, expert performance on this disc stands the test of time very nicely. The market for straight-ahead jazz records was very soft in the late 60s, so in some ways it is surprising that this music was recorded at all. That it was is a tribute to Walton, Schlitten, and Prestige founder Bob Weinstock who believed in the long-term value of the music. These tunes have been unavailable for some time . . . enjoy them! --BOB PORTER, from the liner notes.